3 Reasons Your Kids Will Love An Aquarium | Then there were three..
Aquariums are truly awesome things for anybody to have in the home, especially children. It’s like having your own mini eco-system inside of your own home. Kids love having pets, which is something that you are probably all too familiar with as a parent. You might not want to get a dog or cat for various reasons. Well, getting your kids an aquarium is the perfect solution. Aquariums make for some great entertainment, fish are great first pets for kids, and you’ll get to see endless amounts of smiles too. Let’s talk about the top 3 reasons your kids will love an aquarium. One of the biggest reasons why kids love aquariums so much is because they get to be a little creative. 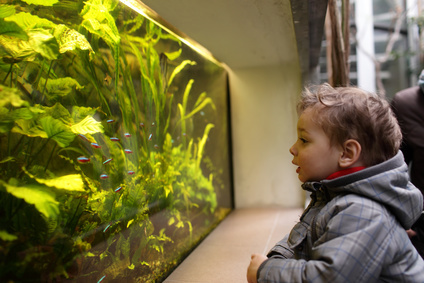 An aquarium is a way for a child to use their imagination and create a world of their own. There is a lot that goes into building a neat aquarium, all aspects which you can let your kids choose. They will love looking at all of the different options in the pet store, which should definitely make for quite a fun afternoon. You can let your kids choose the size and type of aquarium (this site has some good tips on choosing the right aquarium), they can select the substrate and the plants, choose the decorations, and of course choose what kind of fish will live in the aquarium too. You will see just how much fun your kids can have just from creating their own world. When it comes to imagination, they’ll also have tons of fun getting lost in that world. Kids love to daydream about superheroes and living in other worlds or dimensions. The point is that aquariums are a way to allow your kids to use their imaginations and their creativity. They will create a world of their own that will give them countless hours of joy. Being creative is a big skill that can come in extremely handy down the road too. Another big reason why your kids will love an aquarium is because it will make them feel older, needed, and more responsible. Now, as adults we know that responsibility is not always fun, and in fact usually never really is. Adults hate being adults, which is funny because kids hate being kids. Do you remember growing up as a child? Chances are that you always wished that you could be an adult so you could make your own choices and do what you want. Of course that all changed once you actually began fending for yourself, but the fact remains that kids love to feel like they are in charge, they are needed, and they have responsibilities. It makes them feel important. Well, an aquarium is the perfect way to let your kids feel needed and responsible. You can help teach them the merits of being responsible and what it feels like to be needed. While adults may not necessarily like those things, kids certainly do. They will love cleaning the tank, or at least helping you clean the aquarium. Your kids will also love feeding time. Yes, fish need food, kids know they need food, and they will do everything they can to never miss a feeding, even by just a few minutes. Fish are great starter pets to teach kids how to be responsible and look after a living being. Once again, us adults may see this, looking after a living being, as somewhat of a necessary evil, but that is just not so with kids. Also, just like with creativity, learning how to be responsible is something that will also come in handy in the future. Finally, your kids will also love an aquarium because they can definitely be a whole lot of fun. There is that whole thing about creativity and imagination which we talked about earlier. Seriously, your kids can spend countless hours in front of an aquarium imagining a whole different world. However, that is not really what we are getting at here. Simply put, watching fish swim around an aquarium can be tons of fun on its own. Fish are bright and colourful, they all have their own personalities, and they can move in ways that other animals just can’t muster. Simply watching fish swim around is pretty darn fun. Feeding fish and even just watching the plants sway around in the water can be quite entertaining too. Your kids will also love an aquarium because it will help them relax, which is something that parents will undoubtedly love too. The gentle glow of the aquarium lights, the motion of the water, and the light gurgling of the filter all have calming effects on kids. If they are having a bad day, if they can’t sleep, or if they are throwing a temper tantrum, chances are that putting them in front of a fish tank for a few minutes is all they will need to feel better, calm down, and get to sleep. This may not be something that your kids will necessarily like per say, but it is beneficial none the less. It’s also great for parents with energetic kids too! There are many different reasons why your kids will love having an aquarium, with the above 3 reasons being the biggest ones. If you haven’t ever owned fish yourself, we think that you will have lots of fun with them too. You don’t have to go out and buy something massive. Just a small tank with a couple of fish will do just fine. You can always move on up from there if all goes well. Disclosure - this is a collaborative guest post.